House hunters are urged to check the properties’ heating systems before buying in order to help avoid any unexpected costs, after a survey revealed that failing to ask when the boiler was last serviced is the biggest regret homeowners have after moving in. A further 50% admitted they didn’t check whether the radiators were working correctly either. OFTEC, the UK trade association for the oil heating industry, has produced a helpful guide for house hunters outlining the key issues regarding the heating system that house hunters should ask about. One of the first is the suggestions is to find out when the heating system and boiler were last serviced, and whether the person carrying out the service had the right qualifications. This is important because regular servicing ensures the systems are running correctly and efficiently, and also identifies potentially serious problems before they cause any more damage. Fuel bills are often the biggest cost for households, so finding out how much one’s expected to pay over the course of a year is also important. The same goes for the radiators and heating controls – can all the radiators be individually controlled and does the house have a modern heating / hot water control system in place? “With the house moving season in full swing, it’s easy to get swept up in all the excitement of buying a new home. Whilst we’re usually good at asking all the obvious key questions, we often forget about the heating system. 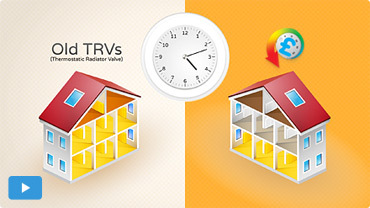 All in all, the HeatSave TRVs enable users to achieve some pretty impressive savings, as they will help reduce your heating bills by up to 30%, especially when coupled with the HeatingSave Building Management System (BMS).